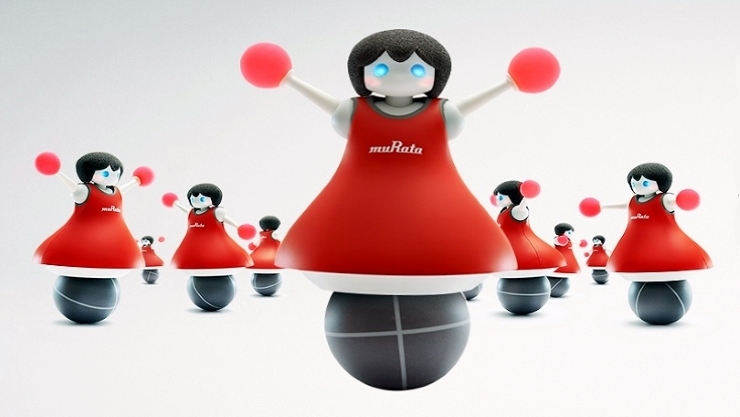 Murata Manufacturing recently unveiled a team of 10 robots, called the Murata Cheerleaders, which dance in formation while balancing on top of balls. The Murata Cheerleaders are Murata’s fourth generation of robots, following the bicycle-riding MURATA BOY in 1991, the second MURATA BOY in 2005, and the unicycle-riding MURATA GIRL in 2008. All of these robots incorporate Murata’s proprietary core technology. In addition to being equipped with attitude control technology adapted from the previous robots, the new robots incorporate group control technology to perform in synchronization while accurately identifying their relative positions. The robot body is equipped with three gyro-sensors to detect pitch, roll and yaw for 360-degree control. Gyro-sensors also are used for camera image stabilization, car navigation, and electronic stability control in automobiles. Ultrasonic sensors are also used for backup sonar in vehicles. In the robots, the sensors enable respective positions to be identified in real time within a four-meter square area. The group control technology was developed through joint research with Professor Fumitoshi Matsuno’s laboratory at Kyoto University. The Murata Cheerleaders will perform at the Murata booth during CEATEC 2014, which will take place at the Makuhari Messe convention center in Chiba Prefecture, Japan from October 7 to 11.